With robotic hands, custom-printed splints, and medicine that can be printed to specific doses, the news is full of ways that 3D printing can help humans live healthier, more productive lives. But, if you look close enough, there are also some really amazing examples of how 3D printing has also been helping some adorable members of the animal kingdom. 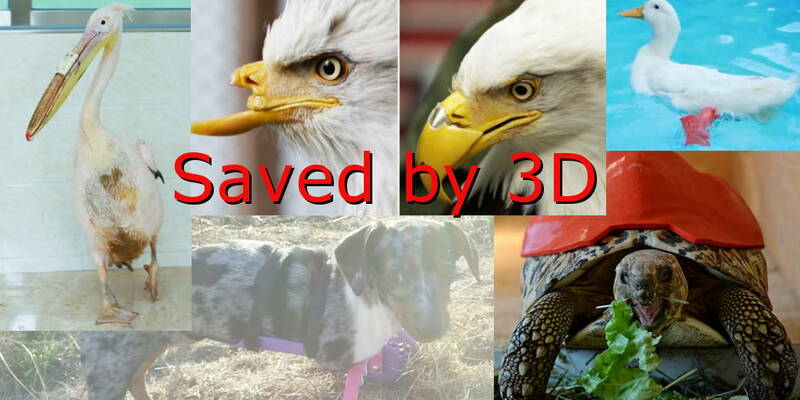 Here are a few of our favorite stories about animals saved by 3D printing. 1. A pelican’s new beak. When a pelican began acting strangely at the Dalian Forest Zoo, staff members soon realized that the bird’s beak was damaged. Because a beak is vital to both food gathering and determining a pelican’s social status, a beak is crucial to a pelican’s survival. After two attempts at repairing the beak through other methods, zoo workers decided that they would try to use a 3D printer to make the necessary repairs. Because it appeared that there was already some new growth, doctors determined that it wasn’t necessary to print the entire beak. The final product is a 3D printed extension that screws into the pelican’s original beak, allowing the pelican to feed normally once more. 2. A turtle’s new home. A turtle’s shell protects them in a number of ways, including from bacteria and infection. In some cases, poor nutrition can lead to a bone disease which can cause the shell to wear away. When that happens, a turtle can be left painfully exposed. This is the fate that turtle Cleopatra was facing. Luckily, however, Cleopatra was taken in by Canyon Critters Rescue. Here, founder Nicola “Nico” Novelli determined that he could 3D print a shell protector to prevent Cleopatra’s existing shell from wearing down further. With the help of Colorado Technical University, a shell was modeled and fit over Cleopatra’s existing shell. As Cleopatra continues to grow, new shells will have to be fashioned to fit. 3. A sea turtle is saved. Who doesn’t love a good turtle story? In fact, we love them so much, we had to include two. This turtle tale takes us to Turkey, where a sea turtle was struck in the face with a boat propeller. The terrible accident left the turtle unable to eat. Rescuers brought the turtle to Pamukkale University. Here, researchers designed and printed the turtle a brand new jaw. The jaw worked so well that the sea turtle was released back into the wild. 4. A duck takes a swim. When Buttercup the duck was born, one foot was pointed in the wrong direction. In 2013, Buttercup’s trainer Mike Garey decided that her best chance of living a normal life would be with a 3D printed prosthetic foot so Garey printed her a walking foot. Soon, however, Garey realized that, while the foot was great for land, it didn’t help much in the water. Garey went back to the drawing board (or the Simplify3D software) and modeled a brand new prosthesis designed just for swimming. Today, Buttercup is able to switch from one leg to another, allowing her to waddle and swim to her heart’s content. 5. Can the rhinos be saved? While this story is more about the future potential of 3D printing saving animals, it is too exciting not to include. For years, rhinos have been poached for their horns, reducing their numbers by 98% since 1960. This massive slaughter is the result of the incredible value of rhino horn. When sold on the black market, rhino horn is worth more than gold and illicit drugs like cocaine. Now Pembient, a Seattle-based bioengineer startup, believes that they have landed on a solution. By creating an ink of keratin, the basic material of a rhino horn, and splicing in rhino DNA, the group believes that it can 3D print horns that are indistinguishable from the real thing. The beauty of this solution is that the horns can be produced for a much lower price than the real thing on the open market. Therefore, Pembient could flood the market with the fake horns, drive down the cost of the real thing, and remove the incentive to poach. 3D printing could literally save the rhinos from extinction. 6. A dog gets a new set of wheels. Meet one of the most adorable animals saved by 3D printing. When Bubbles the weiner dog was born, her proud human parents soon realized that she was missing her two front legs. Determined to make her as mobile as possible, the couple set out to design the pup some wheels to help him get around. Their first thought was to create the wheels out of model airplane parts. When this didn’t work, they bought a 3D printer and got to designing. The couple printed out wheels, complete with adorable little heart patterns, and a harness that was designed to perfectly fit Bubble’s long and thin frame. Today, the design is available to download on Thingiverse for free with the hopes that it can help other disabled dogs. 7. A dog runs for the first time. Derby is another beautiful pup that is benefiting from 3D printing. Unlike Bubbles, Derby was born with front legs, they were just deformed. First, Derby’s owner tried the cart route, but that didn’t give Derby the full mobility that his owner wanted, so they turned to 3D printed prosthetics. To allow Derby to walk on a variety of terrains, the designers opted for a loop-shaped prosthetic. Soon, Derby was up and running. Because the prosthetics are 3D printed, they can easily be tweaked or replaced when necessary. 8. A bald eagle will soar again. Beauty the bald eagle is one of Northern Idaho’s natural treasures, which made it all the more shocking when somebody shot her in the face. Although Beauty survived the blast, her top beak was decimated, leaving her unable to feed herself or survive in the wild. After 18 months of design work, biologists were ready to 3D print a functioning prototype made from nylon-based polymer. As the team fitted the eagle with her new beak, they had to make subtle tweaks to the shape of the beak. Finally, the prosthesis fit perfectly and was glued into place. While the beak is working so far, it is only the first step in fitting Beauty with a permanent beak. These animals saved by 3D printing offer further proof as to the amazing potential of this technology. To keep up-to-date about the exciting developments in 3D printing, join our Spectra3D newsletter.